Radical reform of the UK pension system announced in the Budget has already encouraged pension saving, according to pensions expert LCP. LCP, in its annual report on the pensions market, said the outlook was at its brightest for many years. It said that proposed extra flexibility made pensions more attractive. However, final-salary pension schemes remain firmly in deficit and more changes to the pensions landscape should be expected, it added. But from next April, changes announced in the Budget mean savers will be able to use their pension money as they see fit, from the age of 55. People in defined benefit schemes - primarily where their pension is linked to their final salary - will be able to transfer to a defined contribution scheme should they chose to. In its Accounting for Pensions report, LCP said there was already evidence that this encouraged extra pension saving, although there were still some challenges with the policy to be overcome. Alongside this, a reviving economy offered more opportunities for pension schemes and there were also more options for schemes to insure against a greater bill as members lived for longer. All this meant "there is an end in sight" for some of companies' biggest pension issues. Defined benefit schemes in the UK were still operating at a deficit, the report said, although the gap between assets and liabilities had narrowed. The deficit for these schemes among FTSE 100 companies stood at £37bn at the end of June compared with £43bn a year earlier. Companies' pension contributions have fallen slightly over the same period. 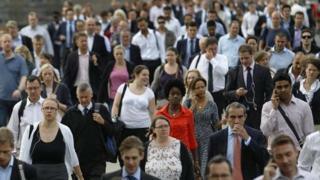 No final-salary schemes among FTSE 100 companies are still open to new members. The report suggested that a vote for Scottish independence could "cause a headache" for some companies in the way they ran their pension schemes, and further changes to pension taxation in the UK was virtually inevitable. "This has been a remarkable year for pensions. Even before the Budget, companies faced a period of upheaval as they came to terms with legislative changes introduced in the past four years," said Bob Scott, the report's author. "Companies have made huge changes to their pension schemes in recent years. All the signs from our latest report point to the likelihood that we will see plenty more changes over the coming years as well." The reforms announced in the Budget have already affected the position of pension providers. Insurance group Legal and General said individual annuity sales were down 49% in the first half of the year to £383m. It also said it was expecting 50% falls in both the second half of the year and in 2015. It claimed that many pensioners would not have saved sufficiently to fund their retirement, and the firm was looking into launching new mortgage products to release cash from homes. By contrast, the group saw a record rise in workplace annuities, including the largest-ever bulk annuity in the UK with the ICI pension fund, covering £3bn of liabilities. It reported a rise in pre-tax profits of 6% to £636m in the six months to the end of June.